Recently we received a new notification regarding Online ‘I’ Forms issuance for import in Weboc system, now Form-I is mandatory for all the import through One Customs & Weboc. The importers filing GDs in One Customs will also be required to have their ‘I’ Forms issued through the WeBOC system. Kindly refer to the subject cited above. 2. 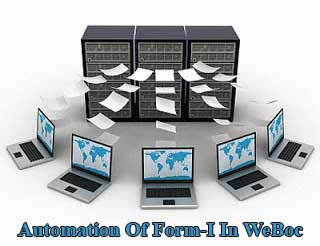 It is informed that this Directorate of Reforms and Automation is in the final stages of software development of Form ‘I’. Under the envisaged system, Form ‘I’ shall be mandatory for all the imports affected through One Customs and WeBOC. Importantly, the importers filing GDs in One Customs shall also be required to have their ‘I’ Forms issued through the WeBOC system. 3. Therefore, it is requested that all such importers who file GDs in the One Customs system, may be advised to get WeBOC user IDs immediately. Subject module is scheduled to be rolled out in the first week of March, 2016.